IdahoHauntedHouses.com recently sat down with Krista Brower-Wood of Requiem Haunted House, to discuss what's new at Requiem Haunted House for the 2018 Halloween Season! 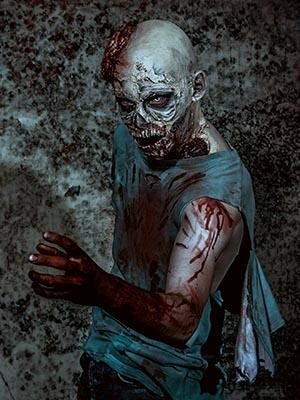 Located in Caldwell, this haunted attraction features 10,000 square feet of indoor terror. Read below to find out what's happening this year! What's new at Requiem Haunted House for 2018? Do you have any new rides, attractions, or special features that Haunt Seekers should know about? Not to spoil the surprise, but we have added on all 3 floors of the haunt. We are most excited for the season to begin and scaring patrons of the Treasure Valley. What differentiates Requiem Haunted House from other local haunts in Idaho? Locally, we are the only indoor haunt in the Treasure Valley. We love giving back to the community and being able to support Caldwell Firefighters Stair climb Team and of course, being able to do Don't Be A Monster, an anti bullying programs,for local schools. How long has Requiem Haunted House been in business? Can you tell us a bit more about Requiem Haunted House's history? Requiem is going on our 3rd year. Our building is 100 years old and is on one of the oldest streets in Caldwell. In 1940 there was a funeral chapel in the basement. In 1960 it was the first JC Penny's of Idaho. What's your favorite experience since opening Requiem Haunted House? We are just amazed how people will come to our haunted house, but no longer want to go in because of the entities in the building. How long is a typical haunt experience at Requiem Haunted House from start to finish? For our average patron the complete experience is 30 to 40 minutes in the haunt. On a scale from 1 to 10, how scary would you say Requiem Haunted House is? Why? We would say 6 or 7. We like to give patrons scares that they have not seen some of which are more realistic than others. Does Requiem Haunted House's property have any real haunted history? Do you have a spooky encounter you'd like to share? We have been told that we have entities in the building. The building did have a funeral chapel in the basement in the 40's. The building is also located on one of the first streets in Caldwell the old wild west. We also have photos of entities that developed while we were building. We love Halloween and everything that goes with it. We wanted to open because we enjoy scaring people and having fun. Our favorite part would be meeting people and of course scaring them. How has new technology (i.e. animatronics, special props, etc) helped you to enhance Requiem Haunted House? We do use animatronics and other special props to just add to the atmosphere of the haunt. Can Requiem Haunted House accommodate large groups? How many people can experience Requiem Haunted House together as a group? Requiem can do large groups (7) but we love splitting the group up into smaller groups so they have a better experience. Does Requiem Haunted House offer any special deals, discounts, or coupons? We will randomly put up on Facebook deals for middle school, high school and even elementary to bring in a school ID to get a dollar off. We do have coupons at different stores as well. Anything else you'd like to let us know about Requiem Haunted House? We do have longer wait lines the closer it gets to Halloween, that is why we open earlier in the season. Thursday nights are great nights to come. We also work every hard so groups do not run into other groups. People do forget that indoor haunts do have occupancy limits.